To be a rule follower, you have to know all the rules. But when you think you are a rule follower and you find out that you didn’t have the right rules — that’s a little unsettling. So I am 8 months out from my gastric bypass and I’ve had some great successes. On Friday, I attended a Stage IV Nutrition class taught by my surgeon. The people in the class were generally pretty far along, probably ranging from a 4-5 months to a year plus out from surgery. She just started this class up and I guess it’s in high demand. It was scheduled for me for March back in December. The doctor talked about hunger at 6 months out, and exercise, and how at this point if we aren’t losing as fast as we want to it has to be something in our diets. She said you had to take a hard look at what you are eating. I consider myself to be rule following, so I figured I had the food part all dialed in: 60-80 grams of protein from supplement, 3 small meals and a snack. I have typically been doing a protein shake (or coffee) before Kaia, one afterwards, breakfast between 9:30-10, lunch around 1 or 2; an afternoon snack most days, and then dinner, followed by a shake or protein bar at night. The class was pretty interactive so I explained how since I started working out more intensely, I haven’t lost any weight. I acknowledged some of that has to be muscle, but my doctor knows my history and my sluggish metabolism. She asked me how many calories I was eating, and I responded 900-1100. And she asked me about carbs, and I said I basically don’t eat any. She told me to keep doing what I am doing and eventually my body will adjust. Considering I really only have 7-9 more pounds to lose (depending on the day since I am bouncing around in a 3 pound range), I try not to let it bother me. Another patient commented that she wasn’t losing as fast as she wanted to (which I am sure I rolled my eyes at her 2 week stall since I’ve been stalled since December). The response that I heard was overwhelmingly shocking. My doctor recommended for people who were stuck to follow some different rules. First, breakfast should be a big, dense shake. She recommended using Bariatric Advantage shakes because they have added fiber and are pretty thick. She made a comment about commercial protein not being good enough for us and asked what kind of protein everyone was using. Now—there’s a list of recommended protein in the materials that she give out. She really recommends Unjury protein since it’s medical grade and it’s recommended especially for gastric bypass patients. 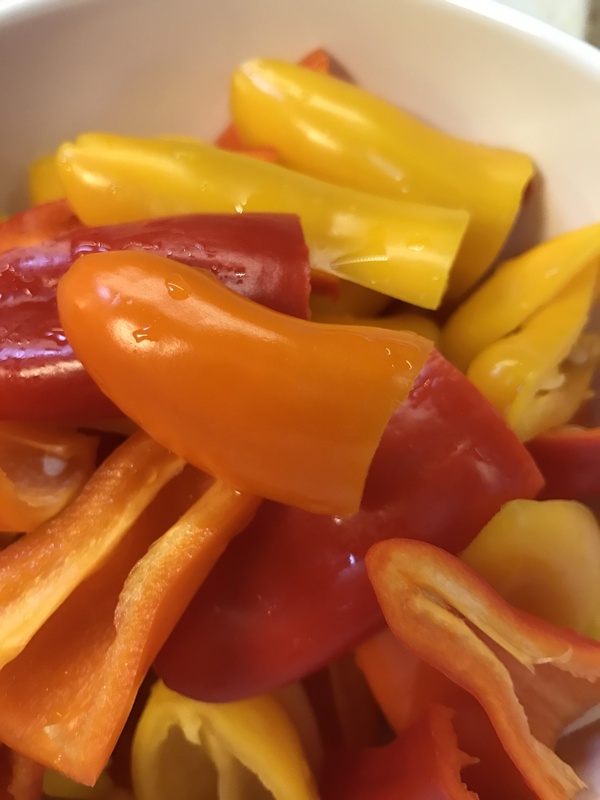 I bought some in the beginning, but when I discovered other flavors by Bariatric Eating, Cafe Bella in particular, I gave up on that plain jane stuff. When I said Inspire, she said, that’s not that good I was surprised! I have been having monthly meetings with the nutritionist and she made it sound like that was a great choice. The doctor said that we can’t expect good results with protein from Walmart or Costco (referring to Premier protein most likely, which it seems like the majority of bariatric patients favor. The other one I use a lot is Nectar, which she said was fine. I was in a state of disbelief though because I have a cabinet full of Inspire protein. I even went on a monthly delivery cycle to make sure I didn’t run out of Cafe Bella — my go to protein for coffee. I kept thinking how am I going to use up all that protein! She suggested adding unflavored Unjury to it and I’d be okay. She also suggested adding more fiber to the first shake of the day to make it more satisfying. She recommended adding flaxseed (which I have done) or chia seeds to bulk it up, as well as using extra protein. She brought out some samples of Bariatric Advantage chocolate which was so thick — made in almond milk. Their protein has a weird aftertaste, which somehow I have become accustomed to, as I also have a bag of Bariatric Advantage cookies & cream which I actually really like, even though it tastes nothing like an Oreo. So my head is turning thinking about whether I needed to buy some more protein while I was there or just wait until I used the rest of the other stuff up. She talked about the protein bars she approves of, since they are whey protein and good for gastric bypass patients. Quest Bars, Think Thin (which I have several boxes of in the protein cabinet) and Pure Protein (the ones you can get from Costc0). She warned for those of us with slowing weight loss, that bars have a lot of other stuff in them besides the protein and are a lot more calories than the bariatric shakes, which typically have about 100-150. So since starting Kaia, I have been using bars as a protein supplement, particularly during the day because of their convenience. My takeaway from the class — stop this. Next earth shattering recommendation: 2 meals a day, and only one of them should have complex carbs. And by complex carbs, she is talking low glycemic fruit and vegetables. Not potatoes, rice, bread, etc. Which is fine, since I don’t eat any of that stuff. Next shocker: you can have as much lettuce, spinach, or kale as we can hold. I miss big salads and I had no idea I didn’t need to count greens in my food portion sizes. So as long as protein is going in first, I can get my fill afterwards with greens. This is helpful as I am getting hungrier, especially after working out. So lunch and dinner should be protein focused. Got it. About an hour before bedtime, have another shake to keep the metabolism fed at night. I kind of knew about that, although was probably having other snacks more often at night, so this is a big deal too. I need rules — and it’s uncomfortable when the rules aren’t cut and dry. So after hearing loud and clearly, 2 shakes, 2 meals — she added that if we’re working out we can have snacks. Like string cheese or almonds. So to me, that’s outside of 2 shakes and 2 meals. Now I am confused again. So today was my first day trying this approach. I think I need to have 3 shakes to get enough protein to fuel my workouts, particularly since I am going from basically 3 meals and a snackish meal plus 2-3 shakes. I’m going to double up on protein in my morning shake and added chia seeds this morning. Nice and thick. I was still a little hungry, and I didn’t have a strenuous workout today, but it was manageable. Let’s see if this will be the thing to kick my weight loss into high gear. 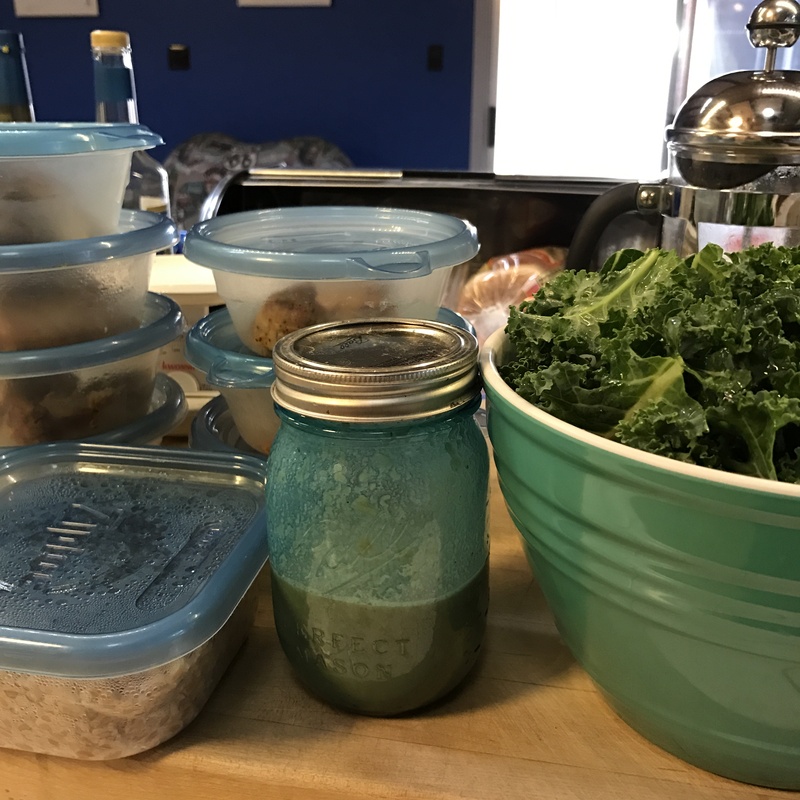 In an effort to get ready for this new way of life, here’s my food prep activities for the week. 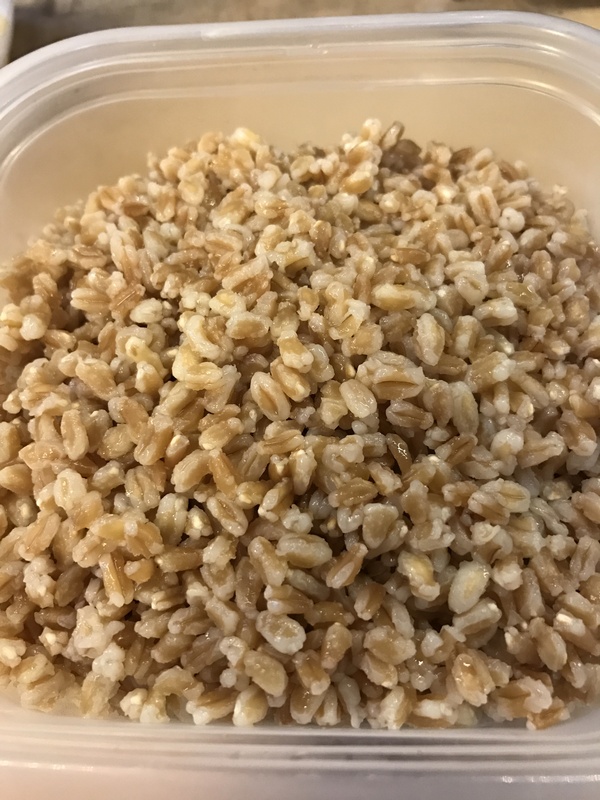 Cooked a batch of farro. I’ll be added 2 tablespoons to salads once a day to add some more bulk, protein and fiber. This is an experiment. I usually don’t do well with these types of carbs, but I want to see if adding a little will help with my workouts and hunger. Prepped a bunch of kale so it’s clean, torn into little bits, and ready to be thrown into salads or smoothies. Made some home made lemon-tahini dressing. I couldn’t find the official recipe, but did this and it came out okay. Whisk all ingredients together in a mason jar and refrigerate. 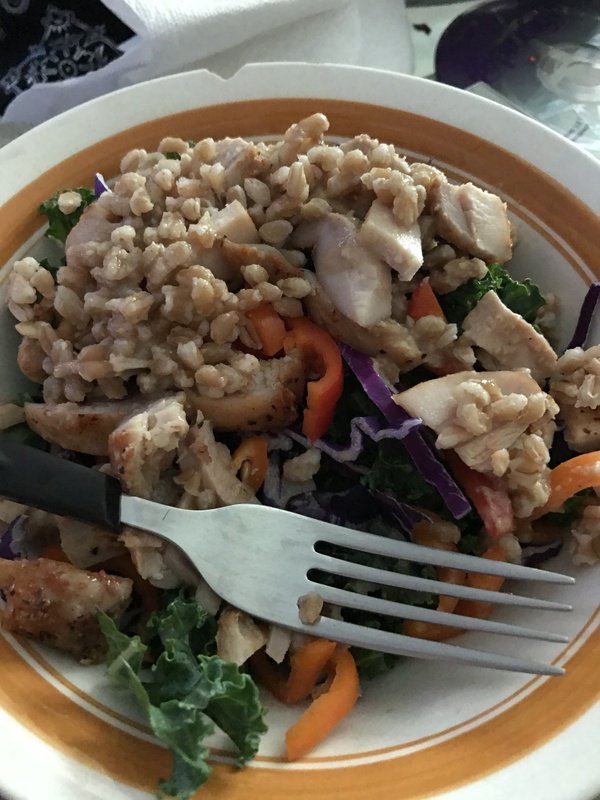 Made a salad from kale, red cabbage, sliced peppers, diced chicken, 2 tablespoons of farro, and 2 tablespoons of the dressing. Yum! And filling. So we’ll see how this goes. If nothing else, I know what I will be eating all week! But What is This Post About Really? This will never be easy. Even though I had surgery, genetics, metabolism, and my own history with obesity are playing against me. I have to work harder than most of the weight loss surgery patients I have gotten to know. According to the doctor, my metabolism may not ever even improve, although my best bet is to continue to build muscle. And sharing this information may be helpful to someone in the same boat, which is why I started sharing my story in the first place. I promise to report back on how well this pays off!